Dissidia: Final Fantasy NT is going to be one of my favourite “fighting games” of all time. It’s not really a “fighting game” but we’ll get back to that in a moment. That’s what it’s being billed as, and, as I said, I’ve enjoyed this one more than any other proper fighting game that I’ve played. It took me a while to get to the point where I could really enjoy it, and there might be a hint of Stockholm’s Syndrome there, but after willing myself through the first couple of dozens of hours of play, rough as they can be, I’ve now come to realise that it’s all quite brilliant. 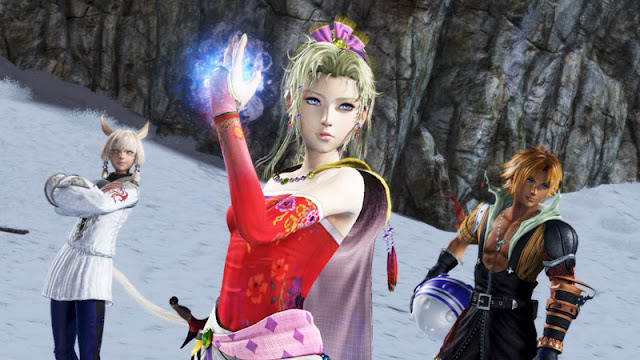 I have been playing Dissidia NT for a long time, though, and jokes aside, it is one whose core appeal is buried and needs some time to dig out. My first experience with Dissidia NT was in the Japanese arcades some two years ago. I spent many thousands of yen sticking one hundred yen coins into those machines after another, and I tell you what, even when it’s all in Japanese and your limited understanding of the language means you understand none of it (because a cursory glance at the game makes it quite clear that you need a proper introduction to it) when you’re as stubbornly competitive as I am, you are willing to spend the money until you understand why you’re losing so badly. That trial by fire led me to look forward to the various Betas of the console version, and I drowned plenty of my time into those. At the time there were all kinds of jokes and criticism about the interface floating around… but I’d gone through the arcade version in a language I don’t understand well enough to comprehend a game like this. I was fine with the interface. And now, finally, many hundred yen coins and hours of my life later, here I am playing the full version. 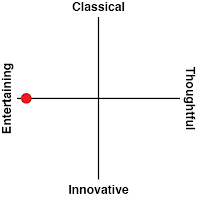 I went through three very distinct mindsets in getting to the point where I see the game as brilliant. Sadly for Square Enix I suspect this game’s going to get off on the wrong foot with a lot of people (and result in some undeserving critical reviews), because the first two mindsets are not so positive. In fact, both as a game and a Final Fantasy title, the early going with the game can feel like it’s very hostile indeed. Before you even start playing, Dissidia is crushingly disappointing. This game exists principally as fanservice for Final Fantasy fans. I don’t mean in terms of swimwear and lingerie costumes, but rather, just like with Nintendo’s Smash Bros series, Dissidia brings together beloved characters from beloved games for a battle royale. Dissidia’s problem (and what Nintendo has got so right over the years with Smash Bros) is that its roster is terrible. The bulk of the roster involved the primary hero and villain from each Final Fantasy game, and whichever designer made that arbitrary and circumspect decision really needs to rethink their understanding of Final Fantasy. In some cases it works – love them or hate them, you can’t argue that Squall, Kefka or Lightning deserve a place in a roster such as this. But with other Final Fantasy games the “leads” were not the popular ones; no one I have ever met has ever admitted to preferring Vaan over Balthier, Fran or Ashe in Final Fantasy XII. And yet Vaan’s the “lead” of FFXII, so he’s in the game. Meanwhile, the villains from the first three Final Fantasy titles are completely uninteresting and generic, and while you could make an argument for Warrior of Light is so iconic to Final Fantasy that he deserves to be there, the “hero from each game” approach also means Dissidia NT counts Final Fantasy 3’s Onion Knight in the roster, who is as redundant of a character as you’ll ever see. Where the roster breaks out from this unnecessarily arbitrary formula, it goes places it shouldn’t; Jecht from Final Fantasy X is not a good character, villain, or inclusion in this roster. Not when Yuna and Rikku are two of the most popular women in the entire franchise. And why on earth is Ace from Final Fantasy Type-0 in there? Don’t get me wrong, I am unbelievably happy that a character from that game made the cut, as Final Fantasy Type-0 is constantly moving up the ranks of my favourite games in the entire franchise. I also appreciate that he was probably added because his card-dealing combat style adds something unique to the mix, but he’s, again, not the characters that people liked most from Type-0 (where is Rem, Square Enix?). We’re promised a lot more characters via DLC, with six more already confirmed, and the nature of this game is such that as long as people continue to play it, Square Enix will be incentivised to keep adding more characters. A bit like League of Legends, really. But we also don’t know which six characters are in the first pack of DLC, and I’m just not certain Square Enix quite understands where the fan favourite characters are. Yes, I’ve spent a lot of time dwelling on the roster in this review, but a fan service game without the right roster is a horrible misfire. Once I got past the impression left by seeing the roster list, I moved to my second mindset on the game; I was still disappoint, but this time with the game itself. Having played the PSP Dissidia titles I wasn’t so concerned with the game’s interface as others have been on their first impressions, and indeed as someone with all that background in the game I was comfortable enough with the in-battle action from the outset, but the lack of stuff that I’m usually drawn to in games is lacking here. There’s only a barebones narrative, the RPG-like features from the second PSP Dissidia is gone, and the single player modes are incredibly thin. Everything about Dissidia NT wants to drive you to the online competitive play, and that’s just not a place I usually like to be. Furthermore, given that all the previous Final Fantasy titles have been built around giving players a quality single player experience, this is another significant flaw when we look at Dissidia NT, as something that’s meant to appeal to the fans of the franchise first and foremost. But then I spent enough time in the online multiplayer to be comfortable with it, and this may just become the first online-dominated game that I am in for the very long haul. I came to realise that there’s actually a lot in this game, it’s incredibly well made and enjoyable to play, and those early disappointments quickly faded thereafter. It took me a while to get to this third mindset, but it’s a polar opposite of my initial response; now I wholeheartedly believe this game is brilliant. You’ll start to realise that it’s not really a fighting game, for a start. There aren’t really any combos, there’s no need to memorise complex button sequences to execute special attacks, and there certainly isn’t the visceral feedback of watching attacks crunch into the opponent. But that’s not because the game is simple or poorly designed. It’s because Dissidia NT is better thought of as a strategic action game, in which you need to master the relative skills and abilities of your chosen fighter, and then understand both teamwork and how to move around the battlefield. It’s closer in practice to League of Legends than it is Street Fighter or Tekken. And for someone who loves fighting games, but struggles with button inputs and combos, that’s something that’s so very appealing. Dissidia NT has the same basic essence and tactics of a fighting game, but presented in a very different way, which requires a very different mastery. As I play online I can see people struggling with this – in fact, of all the fighting games I’ve ever played I’ve never quite come across something like this, with so many newcomers struggling so much to understand the basic principles of the game. 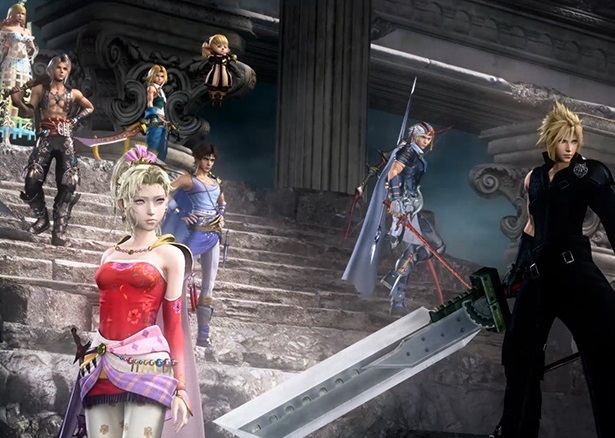 No doubt that will result in a community that’s smaller than it should be for its own good (though hopefully the Final Fantasy license means the initial group was large enough that the community remains stable), but as people give up in frustration, those that are left behind will start to master the combat system, and the depth and strategy of Dissidia NT will become incredible to experience; whether you’re on the field of battle yourself, or watching a stream or similar. Each character in Dissidia is broken down into one of a range of classes – Assassin, Vanguard, Marksman, etc, and those classes each have their own strengths (marksmen are ranged powerhouses, assassins hit hard and fast). In addition, each character has his or her own unique spin within that class; I prefer marksmen myself, and Terra, the mage, plays entirely different to Ace, who throws playing cards around as weapons. 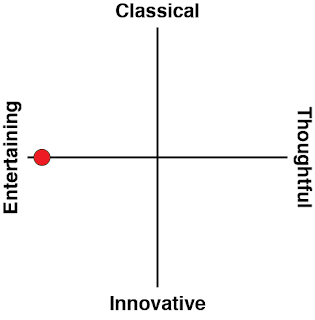 The game is well balanced as a whole – some characters tend to show up more often but that’s more because of their popularity than any inherent strength – but each character is different enough that they have their own unique mastery curve. In place of the combo system of a typical fighting game is a simple, elegant system, despite what the interface might suggest. Each character needs to build up a “brave” meter, by dealing non-damaging attacks to their opponents. These attacks are controlled by a single button press, and you can enact a number of different attacks by pressing different directions at the same time as that button press (pressing up and attack initiates a different attack to down and the attack button). Once your brave meter is built up, you can deal a damaging attack with a single (different) button press. The amount of damage you deal corresponds to how built up the brave meter is. If it does enough damage, then the opponent is knocked out. The first team to score three knock outs wins. That’s it. That’s the fundamentals of the game. There are additional considerations, such as the ability to destroy crystals that pop up at random around the battlefield to cause immense damage to the other side, and each character has a few special abilities tied to them as well. Some of these help allies, some damage enemies, but for the most part, the game is as simple as that. The strategy and depth comes in working well with your team of three to exploit weaknesses in your opponent and protect your own team. This is a game where getting separated from your allies is just asking to be teamed up on, and generally speaking, in a 2-vs-1 battle you’re never going to come out well. 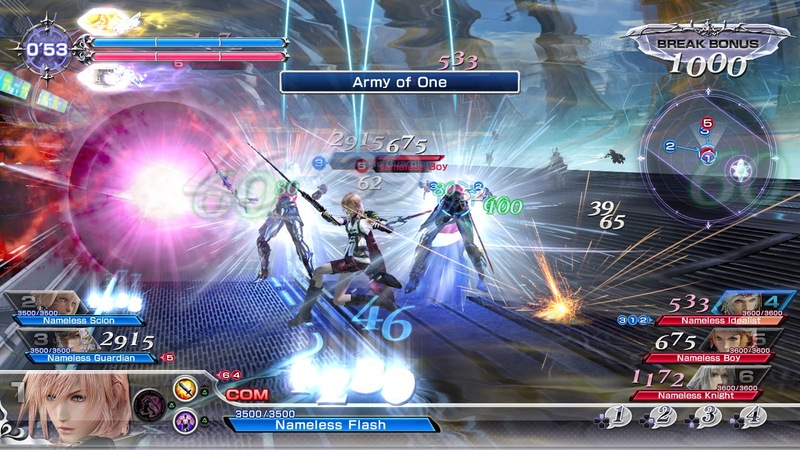 Dissidia has the usual progression systems for an online-focused game that relies on keeping people playing the game over extended periods of time. You’ll unlock aesthetic changes like new costumes for your characters and new skills and abilities as you master each individual character. There’s an awful lot of work involved in unlocking everything, though to Square Enix’s credit it is balanced in such a way that there are no microtransactions and it doesn’t feel like an artificial grind to make you spend real money. Mechanically the game has been balanced so that the stuff you unlock provides a greater range of strategic options without necessarily making you more powerful than someone who hasn’t unlocked that stuff, but in practice a player who has put the hard yards in is going to mop the floor with a beginner opponent, regardless of what skills their character has equipped, so it’s just as well that the matchmaking is tuned to balance sides pretty well. Dissidia Final Fantasy NT is not a fighting game. Not really. It’s a strategic action game and is a clear attempt by the publisher to spin the Final Fantasy franchise into something that can work in the world of eSports. Though I wish there were more characters in the game that appeal to me, the fact that I’m willing to overlook that, and my aversion to online multiplayer and eSports, and find myself itching to get back and play the game some more speaks to Dissidia’s quality, once you dig through the mess to get there. This is, genuinely, the first time I’ve ever been hooked on an online-orientated competitive game.